You probably have lots of questions floating through your mind such as: how will our current dog like the new cat? Will our cat enjoy having a new dog? Will they play? How do I introduce them? Should our old cat share food with the new cat? Hopefully we can address some of these common questions for you. Whether it is a new cat into a house with a dog, a new dog into a house with a cat or a new cat into a household with a resident cat there are some similar scenarios to run through before you make your final decision. The first question you should ask yourself before getting a new pet is do we really need this pet and will it fit our lifestyle, or more to the point, will it suit our current pet? Most dogs will enjoy the introduction of a new pet to the house, being social animals, they live in a family structure like we do so the more the merrier for most! But just like humans, not all dogs enjoy the company of others and we should never get a new pet just to keep our dog company. The personality, behaviour and emotional state of the individual pet should be looked at to see if it is right for them. If you are unsure, have a chat to your veterinarian for advice on how they feel a new addition will work. Older dogs may be sore and arthritic or losing senses such as their vision, so a new puppy around the house, while for some will bring back their puppyhood, for others it will cause increased stress and possibly pain should the puppy want to play too much or too rough. fighting. Cats are very good at communicating through body language and can be experiencing passive aggression without there being obvious hissing and fighting. For some dogs and cats the introduction of another species into their house is less stressful than a same species introduction and once you have carefully made your decision to get a new pet some of the following tips may help make introductions as smooth and stress free as possible. If you are taking on an adult animal or adopting from a shelter enquire about their history with the other species. Have they had exposure before? What were their interactions like? Also consider your own pet or the breed of the other animal for example is your dog prone to chasing anything they can? Is it a herding breed of dog? Is your cat easily startled or aggressive to passing dogs? Consider their personality too. Is your cat confident and able to tolerate new things? Is your dog a rough player who may accidently injure a small kitten? For elderly or anxious pets a calmer, gentle new addition would be best. When it comes time to introducing them take things slow, do not have unrealistic expectations of either animal and follow the tips below. For a new cat into a cat household make sure each of the cats has their own resource stations. Cats should not be expected to share food, litter or resting spaces. They should both have access to their own private litter tray, as well as food and water where they can eat without feeling threatened by the other. For dog into a dog household sometimes introducing them to each other outside the house on unfamiliar territory can allow a smoother introduction. The resident dog will not be worried about resource protection and may be more interested in the new dog. Always ensure the area is safe for both dogs (eg vaccination status) and both dogs are under full control at both times (eg on lead). depending on the situation). Both should have free access to food, water, toilet and rest areas. Not to mention access to you, their companions. Never force interactions between the animals, always allow things to happen as fast or slow as the animals choose. You can offer opportunity for the pets to meet but don’t force them into each other’s space. It is not funny when the dog chases the cat or if the kitten starts hissing and growling. All negative interactions will slow the development of their bond an may even cause irreparable emotional damage. The use of screen doors, baby gates and other barriers can allow a gradual introduction where the animals can safely see and smell each other if they choose. Ensure that the original household pet can always move away from the new pet at any time especially if you have an older pet who is getting a new, younger family member. When a dog is involved in an introduction always use a leash. If it is two dogs both should be leashed and both should be able to move away should they want to. Even if they don’t come face to face they will be sussing each other out and getting to know each other. By having them on a leash and under control we can stop any chasing which can lead to a negative experience or have control should the worst case scenario of aggression occur. Until you know how the pets will interact they should be kept separately secured if they are unsupervised. Over time as you get to know the new pet’s personality and the bond that they may be developing you may choose to allow them to stay together but in the early stages, when tensions may be high, it is not worth the risk. As with any new experience for our pets, we want it to be a good one. The use of their favourite food treats or toys can help them build a positive association with the new pet. Make sure this is safe for your individual pet as some are resource protective of their food or toys but generally speaking if every time your dog sees the new scary cat they get a delicious treat, it won’t take them long to think the cat isn’t all that bad! Cats enjoy treats too, just make sure the dog doesn’t steal them!! Look out for any warning signs such a as a dog that is so focused on the new cat that they cannot follow simple trained commands or who tries to lunge or chase as soon as the cat moves a muscle. Whilst cats may show some hissing, growling or swiping in the early days, this behaviour should subside quickly and they too should not lunge aggressively at the dog. Ensure both pets are drinking and eating well. Animals may show signs of distress by going off their food or toileting inappropriately. Don’t be afraid to admit that this situation may not be right for your family. On the whole introductions generally go well given enough time and space but despite our best intentions sometimes things don’t go to plan. It is better to seek advice, acknowledge when a situation isn’t working and look to find a solution such as rehoming the new pet. Just because one introduction didn’t work doesn’t mean with a different pet it will be the same, however we must learn from our experiences and look at what is best for the family. While these tips may appear like a nagging parent who takes the fun out of a new situation that is definitely not our intentions! 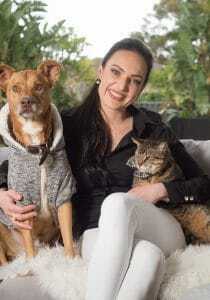 As veterinarians our knowledge in animal behaviour, fear and anxiety is constantly developing and as we become more aware of how debilitating it can be for animals we learn more about how to make their lives as happy and stable as possible. We all love having our fur families around and a new addition is always exciting. We hope through the tips we have helped to make the transition as smooth and enjoyable as possible. Don’t forget to talk to our Pawssum vets should you need advice or support along the way.